The great distances between Asia and Latin America – and the still relatively small trade flows – have meant that dedicated services are difficult and relatively scarce. But the outcome is that connections are potentially available by travelling east, west or south from Asia to the various points in Latin America. North America and Europe have been the traditional transit regions and in 2013 each had about a third of traffic between Asia and Latin America. The Middle East has, in a short period, sprouted into a hub now accounting for a quarter of the traffic flow. Africa and Australia/New Zealand are still very small players, but with ambitions for transfer traffic as they grow their direct services. The small and fragmented nature of the Asia-Latin America market makes it difficult to support through services on what is always a very long haul. Only Aeromexico from Latin America serves Asia, while three Asian airlines have one-stop service to Latin America. But collectively the three Asian airlines have only nine weekly flights into Latin America, and none of the routes is known for its profitability. Asian carriers generally acknowledge and defer to the strength of American and Gulf carriers in providing transfer traffic to Latin America. It is also difficult to construct a long-haul network that depends on Asia-Latin America connections. There are exceptions, notably Gulf carriers, but their presence is still small, with a collective four flights a day to all of Latin America, three of them to Sao Paulo at almost identical times. Airlines like Delta and Lufthansa are major players in the Asia-Latin America transfer market, but again this segment is small and Asia-Latin America passengers comprise a small part of long-haul feed. It is nice filler traffic but still far from being a money-spinner. Partnerships are important, but coordination is lacking between airlines in what is still a relatively low-volume and low-yielding market. This report reviews the Asia-Latin America airline market, including the development of the Gulf intermediary hubs and more fledging hubs in Africa and Australia/New Zealand. The market between North and Southeast Asia and that of Latin America (excluding the Caribbean) grew about 44% between 2010 and 2013, according to OAG data. In 2010, there were on average 1410 passengers a day between Asia and Latin America, and by 2013 this had risen to about 2025 a day. But this market is still relatively small; it could just about fit in the six daily flights between Hong Kong and London alone. Indirect traffic (neither non-stop nor on one of the few one-stop same-carrier services) comprised about 90% of the market in 2010 and 95% in 2013. Launching six daily flights from Asia to Latin America to capture this transit traffic would clearly be unsustainable. The market is generally low-yielding and highly fragmented: in 2013 the five largest city-pairs accounted for 20% of the total market, with the largest accounting for only 6%. 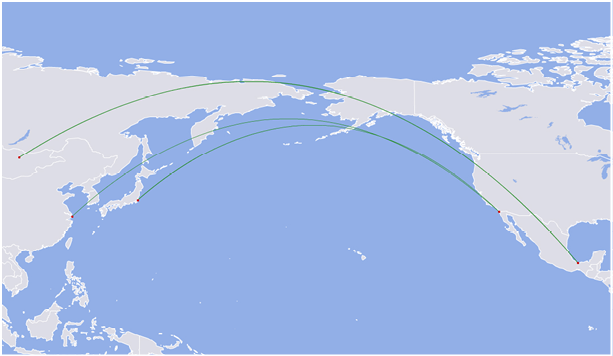 Two of the routes already have through service: Tokyo-Mexico City on Aeromexico, and Seoul-Sao Paulo on Korean Air. The largest city-pair, Tokyo-Sao Paulo, has about 123 daily passengers. But the market then quickly fragments: the fifth-largest city-pair has 61 daily passengers, the tenth-largest 29. The distances involved between Latin America and Asia generally stymie non-stop services. So with the exception of a few non-stop or direct flights, intermediary hubs become necessary. Asia and Latin America are large regions, but the Asia-Latin America market mainly involves North Asia and, on the Latin American side, Brazil and Mexico. The five largest country-pairs accounted for 38% of 2013’s Asia-Latin America traffic. Japan leads, given historical relations and expatriate populations, while China’s trade powerhouse naturally fuels traffic. Korea-Brazil was the fifth-largest country-pair in 2013, but Latin American traffic to/from Korea accounted for only 9% of the total Asia-Latin America market. Japan accounted for 30% and China 27%. Hong Kong was 9%. Singapore and Thailand accounted for a much smaller 3% and 2% respectively. On the Latin American side, Brazil is clearly and naturally the destination, accounting for 38% of Asia-Latin America traffic. Mexico is second-largest with a still formidable 20% share, while third-largest is Argentina with 8%, followed by Peru with 7%. Chile and Venezuela accounted for about 5% each. Technically there are non-stops between Asia and Latin America, fulfilled exclusively by Aeromexico. Mexico is part of Latin America but reaching further south from Mexico City into the main market of Brazil is still a nine hour flight away. Aeromexico in Aug-2014 had a three times weekly service from Shanghai to Tijuana, continuing to Mexico City, and four weekly flights from Tokyo to Mexico City. On the return to Tokyo, the service routes via Tijuana given the longer flying time and Mexico City’s altitude. As Aeromexico grows its long-haul fleet from 11 aircraft at the beginning of 2013 to an all-787 fleet of 20 by 2020, Aeromexico is mulling one additional Asian destination, possibly Seoul, while most additional destinations would be in Europe. Asia-Latam growth can occur through revenue improvement. Aeromexico anticipates the Tokyo service catering to the large Tokyo-Mexico/Latin America market, while Shanghai could feed passengers from beyond China. Shanghai is home to Aeromexico’s fellow SkyTeam carrier China Eastern, and a sizeable position from China Southern, but Aeromexico does not codeshare with them. (Aeromexico’s only Asian codeshare partner is Korean Air.) There may be an increased drive to codeshare if Air China follows through with preliminary examinations on how to place its metal on a Mexican route. Aeromexico uses 777-200s on the longer Shanghai service while 787s have replaced 777s to Tokyo and have allowed Aeromexico to grow, adding a fourth weekly flight, although this has impacted its yields. Aeromexico plans to move the stopover from Tijuana, right over the border with the United States – San Diego airport is 31km away – to Monterrey. There are no geographical gains by moving from Tijuana to Monterrey, as Monterrey is closer to Mexico City than Tijuana, and Monterrey’s altitude is 540m, better than Mexico City’s 2250m, but less than Tijuana’s 150m. Rather, the move is driven by commercial strategy, although this comes with drawbacks. A very small portion of Tokyo-bound passengers were boarding at Tijuana. Monterrey should experience higher local demand than Tijuana given it has a larger business community with stronger ties to Japan. Monterrey is also Aeromexico’s second largest hub and has been the focus of domestic and short-haul international expansion. But Mexico City, not Monterrey, is the heart of the market to Japan; Tokyo-Mexico City is the second-largest Asia-Latin America city-pair, with about 71 passengers a day in 2013 (Tokyo-Monterrey passengers are about eight a day). A minority of the Tokyo-Mexico City passengers – 46% – fly non-stop on Aeromexico, the rest on one-stop options. The Monterrey-Tokyo route cuts across plans to upgrade Mexico City-Tokyo to non-stop in 2015 using a new batch of 787-8s that have higher rated engines. Aeromexico’s 787s as well as 777-200s cannot operate non-stop from Mexico City. The idea of the previously planned non-stop in both directions was to offer an improved schedule in the Tokyo-Mexico City market as well as offering better connections beyond Mexico City to points throughout Latin America. With the Monterrey stop, Aeromexico will end up continuing to offer a less competitive two-stop product that is not even daily, although Aeromexico plans daily long-haul flights by the end of 2020. In the growing South America-Tokyo market, this change will likely dilute Aeromexico’s ability to better leverage its position as the only Latin American airline serving Asia. Some relief is provided in the form of Mexico City’s distance and altitude keeping Gulf carriers away. Prospective service from the Gulf would need to be one-stop, giving Gulf carriers a two-stop service from Asia to Mexico City, although they would likely have a higher frequency, and network feed around Asia, than Aeromexico. The beneficiary of any lost traffic from Aeromexico’s switch should go to North American and European carriers. Asian airlines do not serve Latin America non-stop, but three reach the continent via intermediary points: Air China via Madrid, Korean Air via Los Angeles and Singapore Airlines via Barcelona. All of them only serve Sao Paulo. Air China’s service is probably loss-making and the service is only twice-weekly, as it has been since its Dec-2006 launch (although it was suspended for about a year over 2009). The service was made A330 a few months after its launch with 767s. The Air China service is largely strategic at the direction of Beijing, which wants Chinese carriers to have a global footprint, and Air China is the international flagship. Nonetheless, Air China’s losses have not stopped other Chinese carriers from considering Latin America. 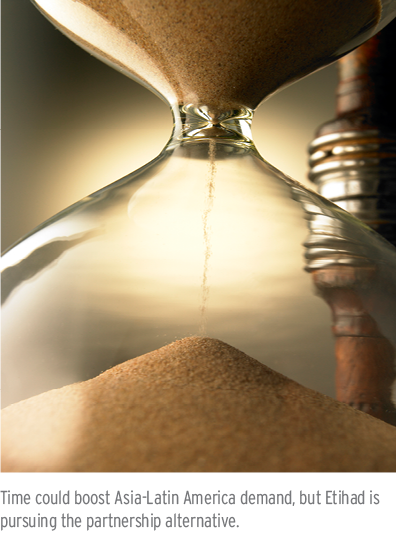 Existing options via Europe can entail lengthy layover. Latin America, however, has not yet captured Beijing’s interest the way Africa has, and China’s significant involvement and investment in Africa makes it likely that Chinese carriers will establish a sizeable position there before Latin America. Singapore Airlines launched continuing service over Barcelona to Sao Paulo in 2011 with three weekly flights on the 777-300ER, a schedule it maintains. Korean Air in 2008 extended a Seoul Incheon-Los Angeles service to Sao Paulo with local pick-up rights. The 777-200ER, and more recently -300ER, service was three weekly until moving to four times weekly in 2014, a combination of opportunity but also needing to bolster its position against American Airlines, which entered the Sao Paulo-Los Angeles market in late 2013, ending Korean Air’s monopoly. About half of Korean Air’s traffic to Sao Paulo is understood to be from Asia and the other half from Los Angeles. Korean Air intended to open a Los Angeles-Lima tag service as well, but this was put on hold as Korean first wanted to see better results from Sao Paulo. Japan Airlines used to link Tokyo with Mexico City (via Vancouver) and Tokyo with Sao Paulo (via New York JFK) but these services were dropped during JAL’s bankruptcy re-structuring. However, JAL is considering plans to re-open its New York-Sao Paulo service but with a 787 and not the 747-400 it used to bring to Latin America. JAL is virtually linked to Latin America via its oneworld partners, but the Japanese market is willing to pay a handsome premium to fly a Japanese carrier. This makes the Japanese market unique; most others opt for a combination of price and schedule, not flag. With JAL’s cost base now lower than it once was, and the use of the significantly smaller 787, the market is now quite possibly achievable. But should this eventuate, it will most likely remain a niche. The concentration of the Asia-Latin America market service in North Asia is a disadvantage to carriers further south in Hong Kong and Taiwan, let alone Southeast Asia. Passengers would be backtracking through Hong Kong and Taipei should locally established airlines there open routes, which seems commercially improbable given the distances involved. SIA’s feed and brand gives it the best chance among Southeast Asian carriers to serve Latin America, but even then the Sao Paulo route is not sufficiently important to SIA. The biggest change in the Asia-Latin America market, as in numerous other long-haul markets, has been generated by the recent entry of the Gulf carriers. Emirates launched its first service, to Sao Paulo, in late-2007 and Qatar commenced in 2010, also to Sao Paulo and continuing to Buenos Aires; Etihad began in mid-2013, again to Sao Paulo. Etihad and Qatar maintain only those services while Emirates has also launched service to Rio de Janeiro, continuing on to Buenos Aires. The Gulf airlines’ Latin American services are inherently tied to feed from Asia. For European and Latin American carriers, Asia connections are the icing on the cake. Air France was the second largest carrier between Asia and Latin America in 2013, but Asia-Latin America traffic comprised less than 7% of its total Latin America traffic, according to OAG Traffic Analyser data. At Emirates, by comparison, Asia-Latin America traffic comprised about 45% of its total Latin America traffic. The higher dependence on Asia for Latin American services means Emirates, Etihad and Qatar are collectively capturing a larger portion of the Asia-Latin America market. This rose to 23% in 2013, according to OAG, up from 12% in 2010. The market share is large yet the penetration of Gulf carriers in Latin America remains small: in 2014 the three Gulf carriers combined offer only four daily flights from the Gulf to Latin America. Growth is not so easy. Existing Latin American destinations are already nudging aircraft performance; some destinations such as Lima, Mexico City and Santiago cannot be served non-stop. An intermediary stop, requiring the blessing of authorities, is a competitive disadvantage. Rio de Janeiro and Sao Paulo are already the closest major cities to the Gulf; fortunately they are also large destinations from Asia. Of potential new destinations, Caracas is further from the Gulf than Rio or Sao Paulo. Bogota is even further and lacks volume. As Latin America is historically tied to North America and Europe (and not Asia), North American and European carriers have more local demand they can supplement with Asian connections. The closer geography of Latin America to North America and Europe permits a wider network since smaller widebodies (and even narrowbodies) can be used. Behind major Latin American cities such as Buenos Aires, Lima, Mexico City, Rio, Santiago and Sao Paulo, traffic volumes from Asia look very thin. India-Latin America demand is small, unlike India-North America, which Gulf carriers are capturing as they increase their focus on North America. North America is more appealing than Latin America given the size of the market, operational accessibility, range of commercial partnerships and the aeropolitical element of open skies from the US to the UAE and Qatar. Time could boost Asia-Latin America demand, but Etihad is pursuing the partnership alternative. Etihad in Jul-2014 announced a partnership with unaligned carrier Gol to place its code on 52 Gol flights across Brazil and 14 destinations across Latin America, giving Etihad reach across smaller destinations. But viewed another way, Etihad’s smaller Asian network compared with Emirates or Qatar places it at a disadvantage for gaining transfer traffic onto its Latin American services. In the absence of a wider Asian network to fill its Abu Dhabi-Sao Paulo service, Etihad is looking to fill the flight with beyond-Sao Paulo traffic. Qatar does not yet have a partnership with fellow oneworld carrier TAM. Etihad could look to boost its Latin American exposure via its strategic partnership with Air Europa, which serves 13 points in Latin America, and its pending purchase of Alitalia, with three points in Latin America. The geography of Spain and Italy offers a greater catchment and the ability to use smaller widebodies to connect thinner routes, even if this requires a connection through Abu Dhabi and then Spain or Italy. Market conditions elsewhere are working against the Gulf carriers: with the Asia-Europe and Asia-North America markets at over-capacity, airlines are charging a connecting flight beyond Europe/North America to Latin America for only a small sum despite the disproportionately longer distance of the extra leg. US-Brazil open skies in 2015, as well as the forthcoming entry of Azul, could result in a surge of capacity, allowing for even cheaper discounting of Latin American tag flights. 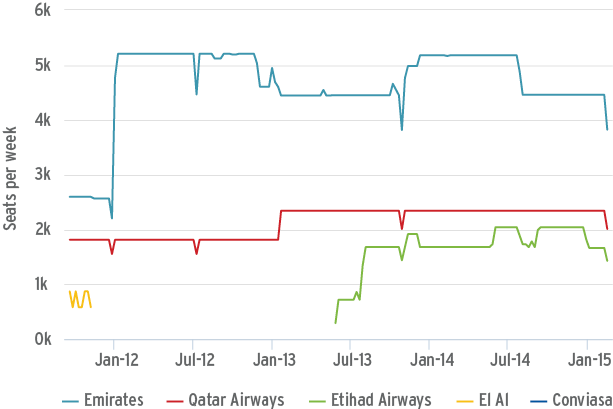 It is not just the Latin American side of the market holding Gulf carriers back. 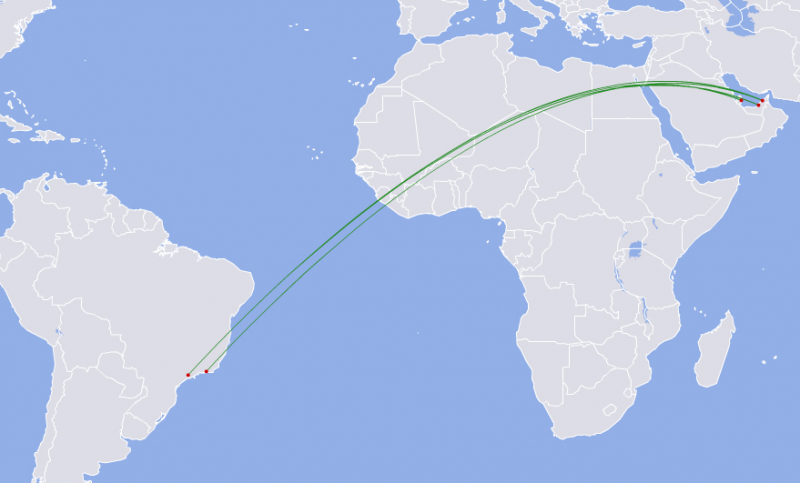 With a high dependence on Asian traffic, feeding more Latin American flights will require more inbound feed from Asia, and in particular the two primary markets of China and Japan. Japan has capped Abu Dhabi-Tokyo Narita and Dubai-Tokyo Narita services to two daily each, plus an Abu Dhabi/Dubai-Haneda service using unpopular nighttime slots. Emirates and Etihad both have unused Narita access rights. China, however, is painfully constrained for Gulf carriers, stifling opportunities to attract further traffic from the market. These networks are hard to balance: adding Latin America capacity without Asian feed will create an imbalance, making for a difficult ride. The local Middle East-Latin America markets are just too small. Turkish Airlines is in a similar position to the Gulf carriers but with some differences. It potentially has perhaps the best service offerings to Latin America. In 2009, Turkish launched an Istanbul-Sao Paulo service initially via Dakar in Senegal and made non-stop in 2010. The tag to Buenos Aires was added in Dec-2012, giving it a Sao Paulo-Buenos Aires tag like Qatar’s. The single daily flight remains Turkish’s only presence in Latin America. But its great strengths are its Eastern Europe and Asian catchments, as well as a large domestic market. In mid-2013, Turkish Airlines planned significant expansion in Latin America to begin in Jun/Jul-2014, mounting two sets of four weekly flights: Istanbul-Caracas-Bogota and Istanbul-Havana-Mexico City. The Caracas and Havana intermediary stops would have alleviated operational constraints from Bogota and the disadvantage of Mexico City’s high altitude, but Turkish CEO Temel Kotil was upbeat on local traffic to Caracas and Havana. If local pick-up rights were offered, fifth freedom traffic could have been small but lucrative. Havana was an odder routing whereas Caracas had logic, although Venezuela’s recent currency repatriation issues have made Caracas unattractive. Turkish has yet to launch these routes or announce a delay, but they still feature on the carrier’s upcoming destination list. Its long-haul growth priority in 2014 has shifted to Asia and North America, with non-stops to Boston and Montreal launched while Seoul, Tokyo and Toronto frequencies have increased. Growth could occur in 2015 when Turkish is due to take delivery of 14 widebodies – a significant sum for a mostly narrowbody operator. Straddling Europe and Asia, Turkish’s passenger mix is unique. Istanbul supports a high proportion of point-to-point traffic that is larger than not only the Gulf carriers’ but also, for example, Air France’s Paris hub. However, with only one daily Latin American service, Turkish is still small. As it undoubtedly eventually grows its Latin America network and greater feed is available, the proportion of point-to-point traffic will decrease. Connections from Asia accounted for about 8% of Turkish’s Latin American services, according to OAG. That makes Asia’s contribution closer to that of European carriers than Gulf ones. Given the circuitry involved of backtracking to Istanbul, Turkish does not have the large Western European transfer traffic European airlines have to Latin America. Instead Turkish’s catchment profile is strongly on Eastern Europe, Russia and the Levant. There is also traffic from the CIS and West Asia, ranging from Baku to Erbil, although this is small. Africa, where Turkish Airlines has quietly but largely grown, is an even smaller contributor to Latin American services. Turkish’s single largest connecting market for Latin America is Tel Aviv, which Gulf carriers do not serve. Turkish has played to its strength – and the Gulf carriers’ absence - and is the largest foreign carrier in Tel Aviv. OAG data indicates that in 2013, Turkish carried as many passengers between Latin America and Tel Aviv as Latin America to all of Asia. Another difference from the Gulf carriers is that Turkey has a substantial domestic market. Domestic Turkish connections to/from Latin America are more voluminous than all Asian connections combined. In the first half of 2014, domestic-only passengers comprised 42% of Turkish’s system traffic. International to international connection comprised 45% of all traffic while international to domestic connections accounted for the remaining 13%. Tel Aviv is by far Turkish’s largest beyond-Istanbul market for Latin America, and other notable source markets are Amman, Athens, Beirut, Cairo and Moscow. Turkish has a geographical advantage over Gulf carriers accessing traffic from those points as going via the Gulf would require more significant backtracking. Aeroflot serves Latin America, but is focused on leisure destinations in Upper Latin America and does not serve Lower South America. Geography helps Turkish’s growth opportunities. Being closer to Latin America than a Gulf hub makes some markets operationally feasible that could not be considered from the Gulf. There are also commercial impacts as Istanbul requires less backtracking from Eastern Europe and parts of the Middle East, as well as Turkey’s local market compared to the Gulf. But Turkish does not serve the range of Asian points Gulf carriers do, and also lacks non-stop connections to Australia. While growth prospects are encouraging, Turkish and Istanbul will certainly not be the size of a western European airline in Latin America. Turkish has more than 30 partners - but none in Latin America. It hopes to codeshare with Avianca, based in Bogota, where Turkish had planned to fly, although onward connections from Bogota would have required an un-ideal three-stop offering with a transfer in Istanbul, Caracas and then Bogota. Avianca also has a sister carrier, Avianca Brazil, based at Sao Paulo, where Turkish flies, but Avianca Brazil only serves domestic Brazilian points. As such, Turkish is open to partnering with other Latin American carriers. Like other Star carriers, Turkish is suffering from TAM’s defection from Star to oneworld. Turkish and TAM had planned to cooperate but prospects for this have ended. The new services to Latin America from Gulf carriers and Turkish Airlines have shifted market share in the Asia-Latin America market. They have had the largest impact but they are not the sole change: also at play are the withdrawals by JAL and Malaysia Airlines from Latin America, and the collapse of Mexicana, which was a partner into Latin America. Although there have been changes in market share, there has been no diversion (or “stealing”) of traffic – incumbents like Lufthansa and United are carrying more passengers between Asia and Latin America, according to OAG, but the Gulf carriers have captured a larger share of the growth, as improved service opportunities predictably grow the market. In 2010, the Gulf carrier market share of Asia-Latin America was 11%, but in 2014 it was 24%. Turkish Airlines has about a 1% share. In Europe, Air France’s share has decreased modestly from 14% to 12%, while Lufthansa has held flat at about 7% and KLM has increased its share from 7% to 8%. In the Americas, United’s share has decreased from 12% to 9%, while American’s share has increased from 7% to 9%. But again, even where Air France and United have lost market share, they have experienced net growth in volumes. With Asia-Latin America traffic a small part of their network, they are likely trading the very low-yielding Asia-Latin America traffic for higher-yielding passengers going to/from Asia or Latin America rather than between.